"Time to brace" - Atlantik-Brücke e.V. Just months into his young presidency, it is clear that Europe cannot presume an even keel, firm alliance, or historically-shared interests with the United States of Donald Trump. The West, as long understood, is in hiatus. Europe must act accordingly. The presumption of a steady, stabilizing US posture in foreign policy undeniably ended in May 2017 during the President’s first trip abroad, where he scolded and physically bullied allies in Europe, praised autocrats, and trivialized the Holocaust. That first trip underlined that he – not the presumed “adults in the room,” his National Security Advisor, Defense Secretary or even Secretary of State – would make the final call in foreign policy matters. Rex Tillerson seems adrift and far out of ear-shot of the President in critical foreign policy matters. National Security Advisor H.R. McMaster has been dressed-down numerous times in front of colleagues. While the Secretary of Defense has fared better, General Mattis’ statements are regularly undercut by the White House. This remains a hard pill for European leaders to swallow. For months, they attempted to assuage their own nervous publics that the long arc of American commitment to European security and prosperity could not be so easily diverted by one man. But, as the President wiped references to Article V from his prepared script at NATO, it became obvious his advisors will not serve in the stabilizing roles European leaders imagined. As North Korea provokes, cyber attacks destabilize market flows and sands shift in the Middle East, and as an erratic American President grows restless with a domestic agenda that is slow to advance, we are entering a dangerous phase in international politics. Time is of the essence: European leaders must pursue a range of parallel policy avenues, focusing on what might lie ahead. First, they must (and have already begun to) consolidate the gains of European integration, particularly in intelligence-sharing, security and economic defense matters. External pressures from Russia and the US are forcing these moves – but they were long overdue. This means expanding cyber-capacities to secure markets and people; deepening the Framework Nations Concept in NATO and yes, committing to 2% GDP spending – over the course of 10 years agreed upon in Wales. All in. And it means making uncharacteristically rapid advances on stabilizing the Eurozone. Second, European leaders must triangulate: The EU-Japan trade deal is one such move. Further careful engagement with China is another. Europe has interests, it’s time the Union articulated them clearly and underlined its intentions to act on them. Third, they must co-opt and extract value: Where overlap exists between the President’s domestically-focused agenda, European leaders must lean in. But they should craft artful deals, and ‘grow the pie’ in the process. The President wants to borrow labor market strategies, manufacturing and entrepreneurship strategies from European countries to revitalize the American heartland? Let there be trade-offs for that type of knowledge-sharing. Fourth, they must collaborate: America’s military might, economic heft and cultural influence dictates that isolation is not an option. Re-upping commitments in the international institutional architecture, upholding strong diplomatic ties with the Trump administration are the standard elements. More importantly, European leaders must retain their holistic view of the United States as one of the most vibrant democracies in the world. Partnering with cities, states, civil society – creating networks and linkages and functioning systems to support these – as mapped out in the priorities of the 2017 G-20 agenda is the right, the only way to develop anticipatory responses to the inter-connected, transnational challenges of the 21st century. It’s time to brace and deepen European security effectiveness and integration and to prepare European citizens for these shifts in global responsibility with honesty and openness. It is an opportunity for Europeans to forge their own “shining city on a hill,” while the world’s historic guarantor of global order is on hiatus. 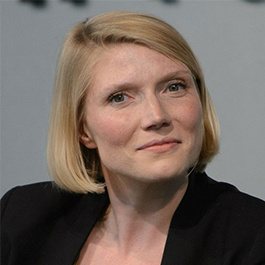 Cathryn Clüver Ashbrook is the founding Executive Director of the Future of Diplomacy Projectat the Harvard Kennedy School and was a 2012 Atlantik-Brücke Young Leader. She will serve as an expert commentator for ARD-Television during the G-20 Summit in Hamburg in early July 2017.